Part One of this intriguing story is here, and part two here ... read them first! As a veteran of eleven years of performing in school concerts, and probably fourteen of listening to my offspring doing the same, I feel quite well qualified to assert that Redborne Upper School made a very good job of their Procol Harum presentation on Thursday 22 March 2018. Close to two hundred audience members gathered in the school’s fine Connolly Hall, with its nice dry sound, sophisticated lighting, and well-raked seating, for a showcase for some excellent young musicians and some sparklingly confident music staff who had trained or encouraged them … and in many cases apparently caved in to their insistence that particular pieces be chosen for presentation. In a quick first half, a capable wind band (with spectacular tuba playing) played a Lloyd Webber selection, and an Alan Menken piece. A choir backed by numerous drums, marimba, vibraphone and xylophone played All Night Long, the Lionel Richie hit. My seat neighbour, Procol's Geoff Dunn, drew my attention to the niftiness of one of the xylophonists in particular. A tremendous drummer named Lily played a funk piece … one of several super percussionists fostered by the music department. The Choir then sang an Abba tune, very nicely, which was followed by the advanced wind ensemble playing the start of The Blue Danube … a foretaste for the Procol fans in the room! The a capella boys’ choir sang Something Stupid with both skill and humour. Their girl counterparts sang a Donny Osmond piece in an intricate and well-articulated arrangement. The Flute Group, featuring some excellent piccolo, then played The Teddy Bears’ Picnic, and a large and punchy brass consort took us into the interval with a deftly-syncopated Puttin’ on the Ritz. The second half was devoted to the heavyweight composers: Hummel, Mozart, Schubert, and Procol Harum! Matthew Holman was a gifted oboist, ably supported by delicate strings in the Hummel. Also with the orchestra, solo clarinettist Catherine Lands played a Mozart slow movement with sensitivity and conviction. Lauren Keane, a very talented lower sixth flautist, played some nimble Schubert accompanied by Mrs Fisher on the school’s slightly pubby piano grand. And the full orchestra … perhaps fifty young players … played a suite of tunes from the Harry Potter films. 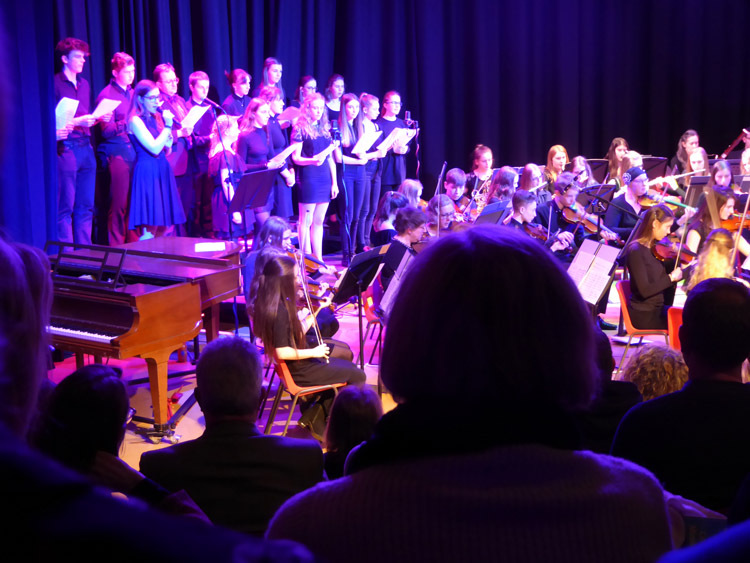 So far, so good: a really capable music department delivering worthwhile music with flair and commitment … end-of-term entertainment, and PR, and good fun of the sort that happens in innumerable British schools in the run-up to the Easter break. But then … something we can be confident wasn’t happening anywhere else … in the world! 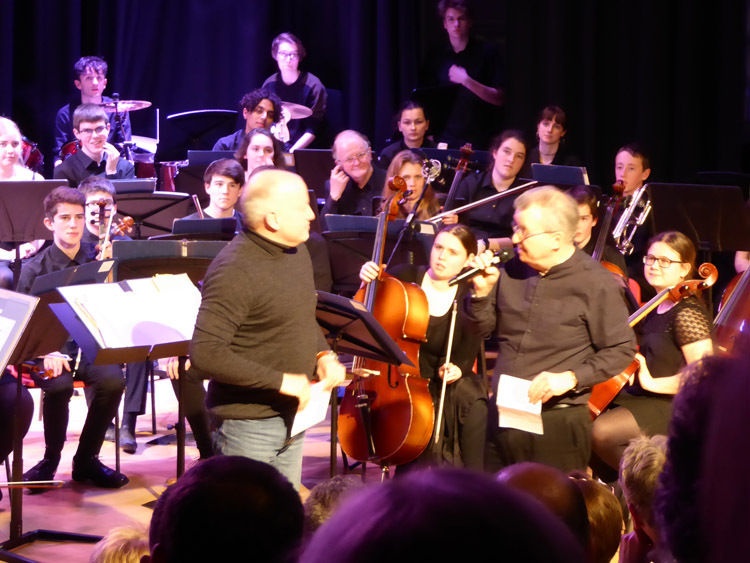 Head teacher Steve Gray, a Procol fan of old, explained to the audience that he’d witnessed Procol Harum’s 2017 Royal Festival Hall concert, and had thought of a good way to commemorate the last few terms of his teaching career: by reproducing some of that music with his students. His enquiry to BtP had been quickly forwarded to Gary Brooker; Gray and Gary had met at a gig and decided how to proceed; David Firman had kindly supplied scores, and the pupils, under their energetic MD Ben Bottone, had got to work. 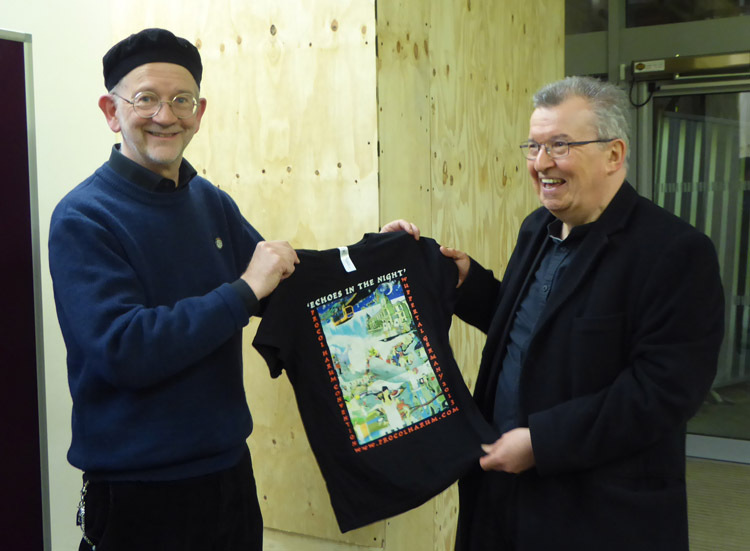 Steve was kind enough to thank the UK webmaster for his enthusiasm for the project. Certainly we’d shared plenty of phone calls about the matter … but it was only in the very last one that the head teacher had vouchedsafe that he himself was intending to play some piano and organ with the orchestra! 2017 was not only the fiftieth anniversary of Procol Harum, he told the audience: it was also the fiftieth anniversary of his passing Grade I piano. Steve Gray’s oration had covered the arrival of the rock band, who sat behind the orchestra, and the opening singers on the raised platform upstage right. 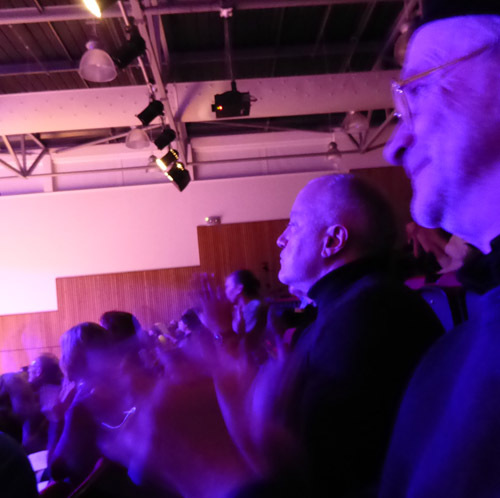 He then read a goodwill message from Gary Brooker MBE, unable to be present because of scheduled medical appointments, but thrilled by the whole project, and offering two pieces of advice from his long experience: that the tempi be correct, and that everyone should enjoy themselves. Conquistador was first up, played with great energy. I thought it felt a bit fast. ‘Maybe we play it too slowly,’ quipped Geoff Dunn, in a rather Brookerish response. The singing, shared by Sixth-formers Emily and Beth, was well done, with an interesting innovation: no quavers, dotted notes or syncopations in phrases like ‘and as the gloom begins to fall’ … just smooth notes of equal value, starting with one note just before the bar line. Gary Brooker's Edmonton arrangement was played with great gusto in the orchestra, and with real panache on the bass and by the aforesaid Lily on drums. The rock group element was not particularly developed …. no guitar or organ solos … but the orchestral brass in particular were doing a superb job and the applause was sustained. Next up, A Whiter Shade of Pale, starting with the Darryl Way minor key prelude. 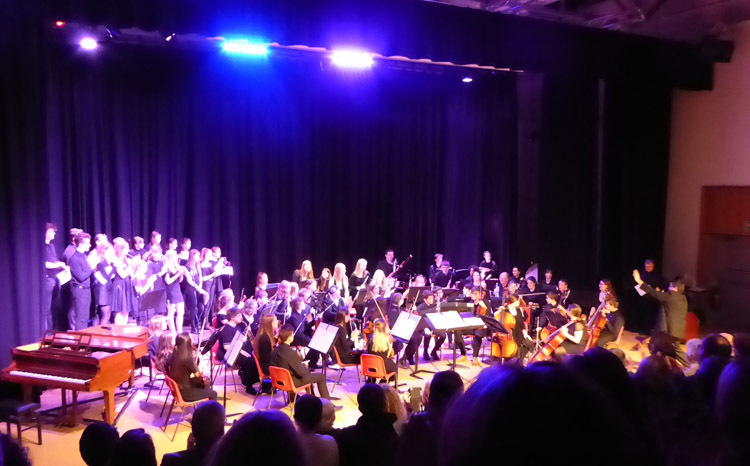 School string orchestras can sound ropey and unconvincing: this one really didn’t! And the woodwinds pulled their weight as well. As for the singing, Beth took this one on her own, and it was delightful: she sang from the heart and let the strange narrative unfold quite dramatically without ever striving for effect. The orchestra and conductor managed the build-up well, and the Headteacher’s organ-line shone through where required. All splendid. Then A Salty Dog! On came the choir, and taped seagulls started up (unnervingly loudly, from Lily's iPad). The MD wondered if we could smell fish and chips! The gulls began afresh, and all proceeded hunky dorily. Lewis, the technician, sang with feeling, found the high notes, and generally acquitted himself very well on this most challenging of Brooker compositions. The drummer didn’t risk BJ’s commanding first entry, nor did his percussive colleagues ‘fire the gun’ in verse three though a sound-effect was provided, again from the Lily-Pad. But it was an accomplished performance, Latin and all, with some suitably chilling moments. Applause, as for the previous number, was instantaneous and sustained. And finally, Simple Sister. It started with terrific walloping and hollering as expected, and with a surprisingly clean lead guitar tone, which was another interesting innovation. The lead was nicely sung, by Emily again; again it sounded very natural, despite the troubling libretto, and it cut through the meaty playing … and the full blooded choir … very well. The ‘Cool Jerk’ episodes were given a lot of moto, and the build-up in the middle was expertly controlled. No guitar solo, but a lot going on in the orchestra … and it was nice to hear all the detail. When the show was over, Steve Gray warmly thanked all his players, and the audience. It was very clear how much he’d put into this project, and how much he’d got out of it. I got a strong sense of a supportive and fertile relationship between staff and pupils, and a generous and warm response to the eccentric challenge of mounting this music … possibly the first-ever amateur performance of arrangements which not even the professional band performs very often. Five teaching members of the music department were listed in the programme, and in addition fourteen peripatetic teachers of various instruments. Good job all round! In conclusion Steve advertised the band’s forthcoming London Palladium gig, mentioned Gary Brooker and David Firman’s generosity again, and produced a cheque for the BJ Wilson fund by way of thanks from the School’s side. 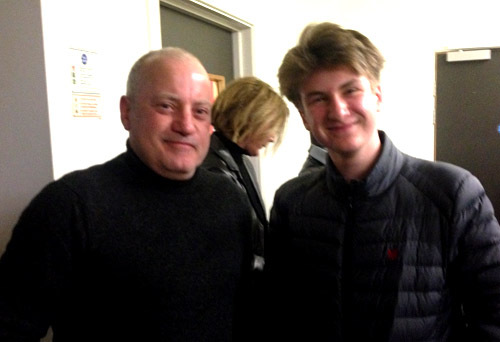 Very appropriately, and with well-chosen words, he invited Geoff Dunn to come down and receive the donation on his percussive predecessor’s behalf (see illustration), and Geoff thanked the musicians and the school for a very enjoyable evening. 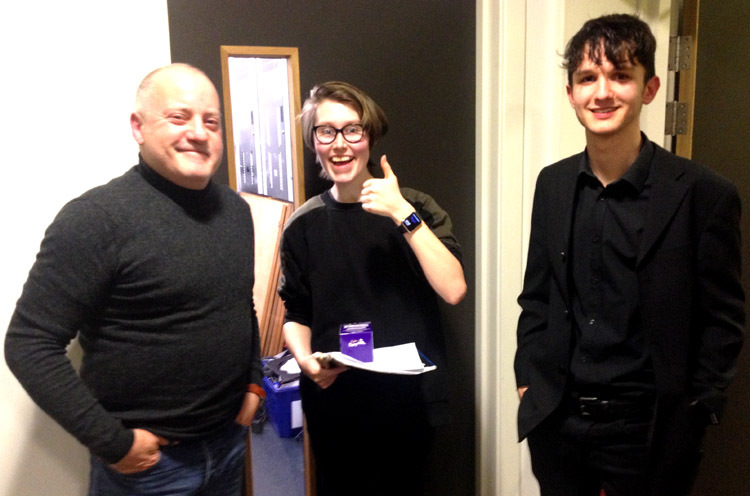 Geoff later took the opportunity to chat backstage with the percussionists in particular (as pictured) … one of many highlights for these great young players in what must have been a very memorable … and certainly worthwhile … term’s work.